This is the first book in the No Secrets on Lake St. Clair series. 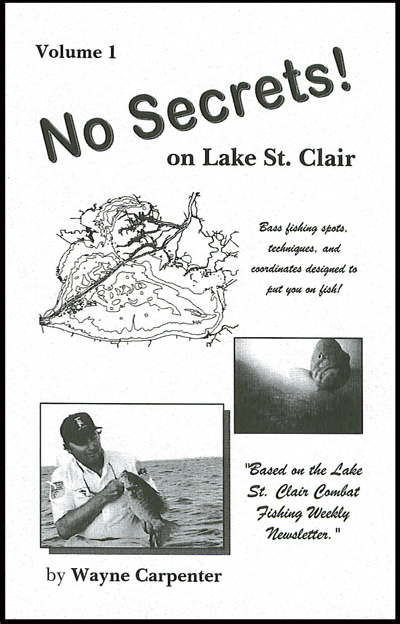 It is definitely the product of my research time on Lake St. Clair but I dedicate the book to all of the people who have spent countless hours on the water with me to grind out the detail necessary to make this information practical for anglers. It is into its second printing and sales continue to be strong. White Hot Spots – All No Secrets books start of with 12 hot spots from around the Lake. A GPS coordinate is provided as is spot level detail and well rounded general information about the way bass relate to the spot. The Firecracker – This is a pivotal structure in the system which marks the end of the shipping channel and the beginning of the Lake. Even under heavy fishing pressure this spot can still produce by replenishing schooling smallmouth throughout the day. Current and Big Fish – Using the underwater camera has opened up new avenues for techniques and presentations to reach big fish in the current. Gathering hard data with the underwater camera dispels some myths about seasonal bass position. The Big Picture – Using an underwater camera opens up an entirely new world to the angler. This chapter answers some questions about how the camera operates in fresh water and tips to make the viewing (or video taping) experience the best it can be. The Belle River Hump – On the page opposite the chapter there is a list of 50 GPS coordinates to get you started on this large lake structure. Get specific information on bass behavior and bottom content that will help you gear up for a productive trip. Seasonal Zones – See a chart of how the spawn breaks out around the Lake in the early season. Also get more insight into the spawn, post spawn, summer bite, fall transition and fall periods. 5 Minute Spots – Nine spots covered that you can get in and get out fast with your catch. Coordinates are given for six of these spots. Vital Statistics – Just one part of Vital Statistics gives you 50 GPS coordinates for major spots or landmarks around the Lake. This entry was posted on March 10, 2010 at 12:14 AM and is filed under Xtreme Bass Tackle products. You can follow any responses to this entry through the RSS 2.0 feed. You can leave a response, or trackback from your own site.